Eva Thorvald's father was a chef who fed her gourmet pureed meals when she was just a baby. She grew up to be a chef herself, able to charge $5000 a plate for a dinner with a years-long reservation list. What happened in between is told in a series of interconnected stories, each of which is focused on a different character. Every chapter is named after a food, from "Lutefisk" through "Bars," ending with the more general "The Dinner," which is the name of Eva's pop-up restaurant. In some chapters Eva is only peripheral, but she is always present. As a child, Eva was raised by her aunt and uncle (definitely not foodies) and her life was not easy, nor was her trajectory clear, but she was always very good at food. She could tolerate the hottest of peppers, winning many bets when she was very young. Later she went on to pursue more refined culinary goals, such as sourcing only the best, most local heirloom ingredients from the farmer's market. 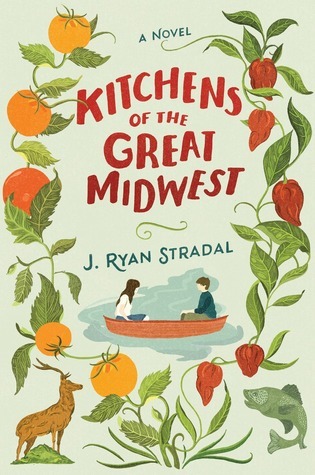 Filled with delectable descriptions of food, the novel also pokes fun at the more ridiculous parts of foodie culture. In one of my favorite scenes a woman named Pat Prager brings her traditional peanut butter bars to a really snooty baking contest and is scolded by a woman who is so horrified that the bars contain actual butter that she consults with her husband as to whether she should go vomit it up out of concern for her unborn baby. This whole conversation is priceless. I'll admit that I'm a regular customer of Whole Foods and try to reduce my intake of overly processed foods, but even I realize how ridiculous this is. I love good food - and sometimes it's exactly the sort of thing the hipster foodies in this book are making - but I also really enjoy making fun of the culture around that food. Another of my favorite parts was at the beginning when Eva was just a baby. Her mother, Cynthia, did not get a sommelier job she really wanted. She was so angry that she paired a Stag's Leap merlot with a bowl of boxed macaroni and cheese. As someone who has traveled to California and purchased merlot from Stag's Leap, which I then felt compelled to save for the most special of occasions, I appreciated this more than I can say. This book was filled with such moments. By the end, I don't even know if I actually even like Eva, but I do feel that I've gotten to know a number of new and interesting people who are all interconnected and I really liked meeting them. The structure reminds me a bit of Olive Kitteridge but otherwise it's a very different book. Focusing on different characters in each chapter provides insight into people in Eva's life, a perspective that you wouldn't get if the book centered completely on her, and I think it works really well. I get very distracted by food, but ultimately, this book is about Eva and her family. Her mother runs away with the sommelier who got the job she wanted, her father dies unexpectedly young, and Eva is sort of afloat and untethered. Her cousin Braque seems to be a constant, but mostly it seems to be food that really keeps her moored (and despite her high-falutin' fancy dinners, she really loved Pat Prager's peanut butter bars.) I should mention that the book contains recipes (including the afore-mentioned peanut butter bars) so this is definitely a novel geared towards food lovers. What I love most is how Stradal has embraced both gourmet and traditional food culture, and the end product is something that many of us will love. Highly recommended to anyone who likes stories about food or family. Kitchens of the Great Midwest will be published later this month. I received my copy of courtesy of Penguin through their First Flights program. I was not compensated for this review.